As I have been mentioning, my son has been on a Greek fast leading up to the Greek Easter and so our kitchen has become quite vegan for the past few weeks. 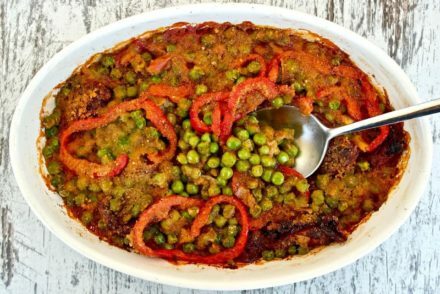 Of course the Greek cuisine and diet provides an abundance of vegan recipes, and this is one of them. 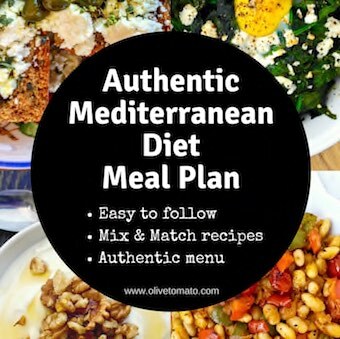 Greek cuisine is known for all the vegetable patties and one of them are the chickpea patties which are very similar to the famous falafel, but a bit softer in texture. This recipe though is a bit different. 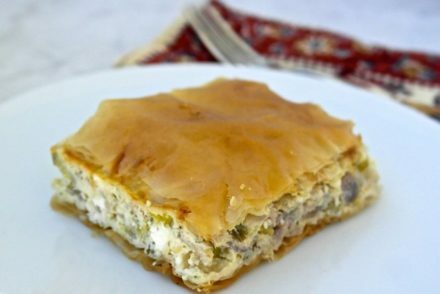 It is inspired by a recipe from the famous Greek cook Tselementes. 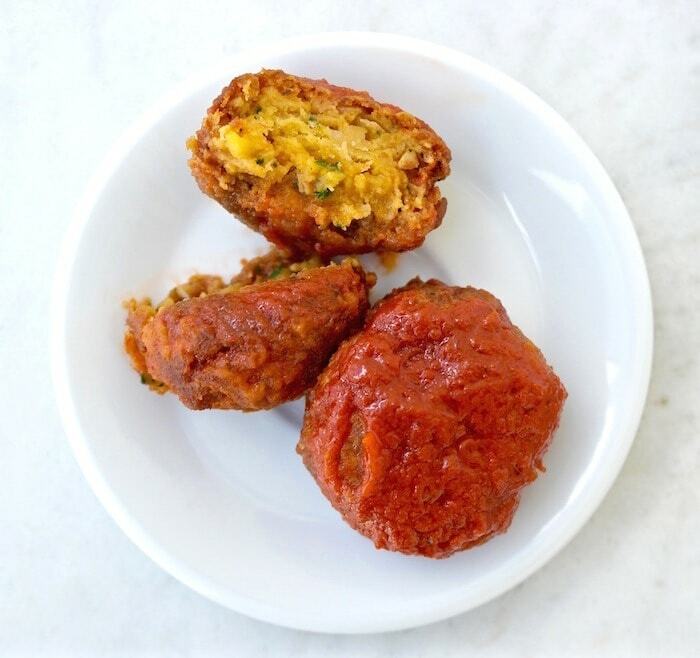 The chickpea patties are made with a combination of the beans along with fresh tomato and then drenched in a rich red sauce made with tomato paste and olive oil. 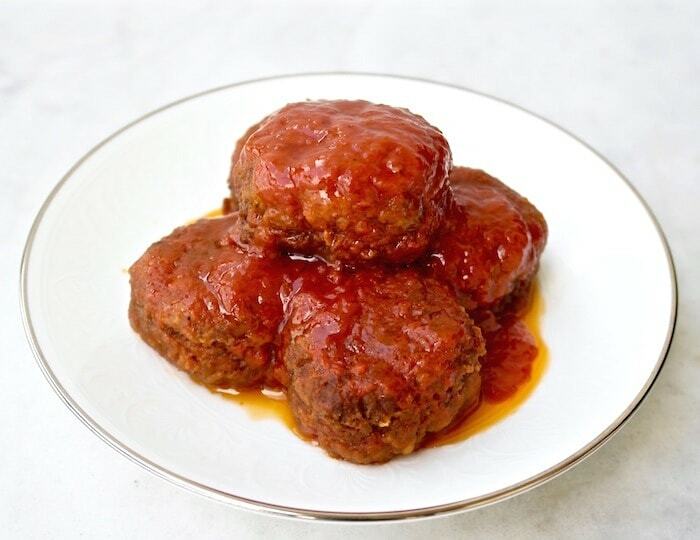 I adjusted it, so it is basically a vegan version of the famous Soutzoukakia, which are meatballs (fried or baked) topped with garlicky tomato sauce. These are called revithosoutzoukakia from the Greek word revithi which mean chickpea. I have to say these patties are rich and decadent and one of the most delicious dishes I have ever had. I literally ate a whole serving this morning, I couldn’t wait till lunchtime! 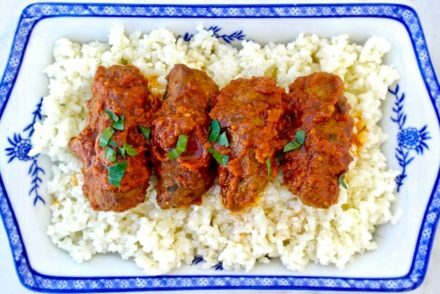 These taste so good and satisfying that you do not miss the meat at all, and they are pretty healthy. You are getting a good serving of beans with their antioxidants, protein and fiber, plus the good fat from the olive oil and tons of the potent antioxidant, lycopene from that tomato paste. Tomato paste may seem strange, but years ago it was used as a substitute for tomatoes when fresh ones were not available. Tomato paste was made at home as a way to preserve tomatoes to use during the winter.Heating tomato paste with olive oil and water provides a intense tomato sauce which makes this dish special. Also you are not just pouring tomato sauce on top of the patties, you cover them with sauce and heat a bit more so that the patties are actually softened by the sauce. The sauce usually contains garlic as well, I chose to omit the garlic in the sauce for a “lighter” flavor. *If you choose not to make the sauce, serve these with some squeezed lemon. In a food processor mix the chickpeas and tomato, do not over mix, the mixture should be grainy. Add the garlic, parsley, 1 tablespoon olive oil, water, salt, pepper and baking soda and blend. Again do not over mix. Place the mixture in a bowl (dough will be very sticky) and add flour, 1 or 2 tablespoons at a time. Knead with your hands, the dough should be soft but firm enough to shape into patties. Roll into balls , flattening them a bit, using about 2 teaspoons of the mixture for each patty. Coat with the flour. Heat olive oil in a pan (oil should be about ¼ inch deep in the pan). Fry the patties about 2 minutes on each side. Remove and place on paper towels to absorb any oil and set aside. Begin the sauce by heating the tomato paste, olive oil and water along with the sugar, salt and pepper in pan, let it come to a boil and then lower the heat. Add the chickpea patties to the sauce and spoon the sauce gently over the patties. Heat for a 1-2 more minutes and serve. This sounds very tasty. What purpose does the baking soda serve? Thanks Jennifer. The baking soda helps the patties puff up so that they are light and airy. Why not baking powder. That’s what I use in other ‘keftedes’ that use flour with main ingredient like tarama and onion to get the puffiness. does soda have the same effect? could you give me a clue what does “overmixing” mean? what’s the difference between well-mixed ingredients and overmixed in this recipe? You basically do not want the mixture to become like a paste or smooth like hummus, it needs to be a bit grainy. Thanks! I had assumed that would likely be the case but wanted to check! Thanks Caroline. Yes canned chickpeas (which are already boiled) or you can boil your own. So, took 2 cans of beans (roughly 3 cups), drained and mixed following the recipe. To get a firm dough i had to add 1 1/2 cup of flour and even then they were very sticky. Fried them and they tasted like crap. Really really bad. Either I’m dumb or your recipe is off somewhere. Maybe it must be cooked dry beans? Please point that out if that is the case. Hi Tomas, I have used both (canned and boiled from dry). In the photo I have used canned beans. Perhaps you over mixed. Not sure why it did not work for you. The beans need to be drained as well. This is a great recipe. Can they be baked rather than fried and if so at what temperature and for how long? You can try baking them at 350 F (175 C) for about 30-40 minutes, spray or brush olive oil over them before baking. Thanks for this recipe. I made these without the sauce. Everybody loved them, even the kids who usually avoid beans. I did need to add more flour to get the dough more solid. Just making these now, the patties by themselves are fantastic. I used 1 – 19 ounce can of chickpeas, got 2 1/2 cups. Can’t wait to try with sauce…..excellent for lent, thanks! I made these and they were SO good. The next day, I fried a few eggs (in olive oil, naturally!) and put them over a few reheated patties, then poured the last of the sauce (I made extra) on top. Everybody scraped their plates clean! Thanks for a great recipe! I made these last night for the family — delicious! Every morsel was gobbled down. I’ll be doubling the recipe next time. Thanks so much for sharing this and all of your other recipes. I made these but the small patties did not hold their shape in the oil. They came out more like hash browns which I formed into a large patties. Plus the number of small balls was way more than 20. You may need to mix a bit more, the chickpeas need to be a bit grainy but not chunky, otherwise they will hold. Elena, these were so good. I followed the recipe exactly and they did not disappoint! My kids loved them. I had fun telling them about you and your blog. They wanted to know why grownups spend so much time on the internet looking at recipes. 🙂 I love your blog, and I’ve made so many of your recipes over and over. They are fresh, healthy, flavorful and realistic for a family. Thank you! Thank you Maria! Yes, I think that is key: realistic recipes. These were a huge hit and we’ll definitely be making them again. Thank you! This recipe is absolutely amazing! The flavour is delicious, these are fabulous. These are the best Chickpea Patties I have ever had. Highly recommend them to anyone. can we bake instead of fry? If so, what is the method for baking? You can bake them at 350 F for 25 minutes. Brush each patty with olive oil before baking. I have a question… traditionally, would Greeks have used all purpose flour? I’m not asking to disparage your recipe but I’m truly curious as I do not use all purpose flour at all if I can help it. Thanks! I should clarify that… would it have been like the all purpose flour that has been processed to death as we have here in the US ? Generally ingredients were much less processed, but yes flour was used traditionally. I love this recipe. I’ve made it with canned and beans cooked fr0m dry, also with fresh tomato, or canned tomato. The basic recipe seems to have a lot of give to it, so don’t worry if you have minor substitutions. We always double the sauce (and assume that teaspoon means regular table spoon and not measuring teaspoon). Thanks for the recipe Will try this recipe, but they must be tiny at 2 teaspoons mixture, how many of them make a serving? About 5 patties per person. Help!!! I want to make this recipe tomorrow. Can you please clarify — do I use 750 grams of canned chickpeas for this recipe (the recipe above states 3 cups of chickpeas canned or boiled)? Also as a main meal can I make larger patties at, say, 50 grams each? If so, how many can I serve as a main? and do I have a salad and feta with it? Hi Mary, Yes 3 cups is about 720 grams. For a main I would serve about 3 larger patties along with some feta and salad. Another question Elena … could I have the green bean lathera as a main and the patties (minus the sauce) as a side dish? I’ll have to try these as they look easier for home cooking than falafel, which incorporate bits of raw chickpeas, small fava beans or both, and must be deep-fried. My all-purpose flour is organic and unbleached.